pull-outs, picnic areas, and hiking trails close at sunset. Over 40% of the refuge is open for recreation (Public Use Area) while the remainder is closed to protect the animals and their habitats from disturbance. We invite you to explore and enjoy the many wildlife-friendly recreation and education opportunities in the Public Use Area. Hiking limited to daylight hours. 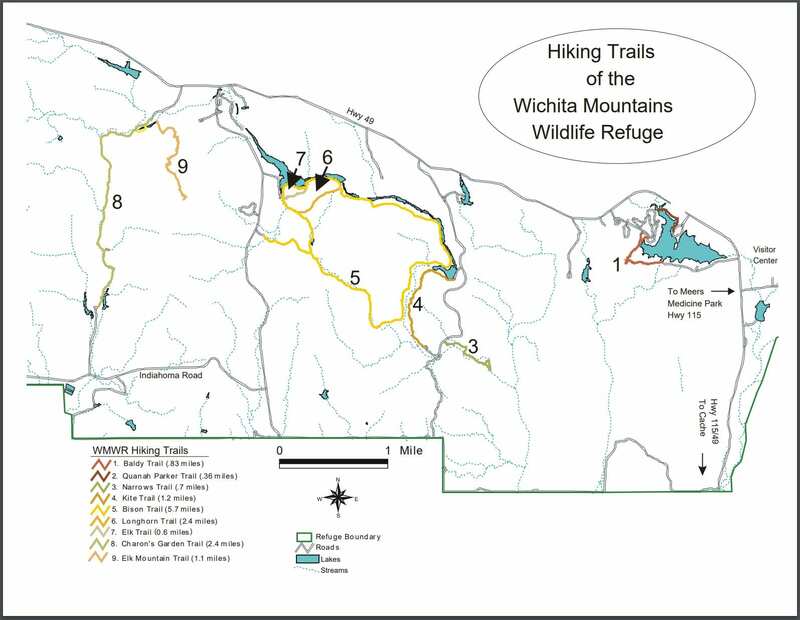 Please read the FWS Trail Map Brochure for Refuge rules and regulations; and check the U.S. Fish and Wildlife Refuge website or Facebook page for up-to-date information on closings and alerts. Bison and longhorn are wild and may charge—don’t get too close. Rattlesnakes and copperhead snakes make their homes here. Poison ivy grows in shady and damp areas. Ticks and chiggers are common residents.